Travels with a Tin Donkey: Giro di Coppi Day! One demanding course: try riding 50-75 miles on this! One of the toughest but most scenic races in the Washington, DC area is that hosted by my racing club, Squadra Coppi. 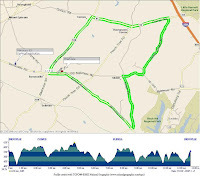 The Giro di Coppi is a 12.5 mile circuit through hilly, green Maryland countryside and is usually held in oppressive heat and humidity but this year there was a welcome respite as the day was glorious and the racing hard and enthusiastic. I manned the registration desk today and entered the Cat 1/2/3 racers. and his prize: the famous Fausto Coppi bobblehead trophy!